Your day-by-day itinerary now includes Lemmenjoki National Park as well as Pakasaivo. Kick off your visit on the 16th (Tue): explore the wealth of natural beauty at Lemmenjoki National Park. To find reviews, other places to visit, traveler tips, and other tourist information, read Levi tour builder tool . Bern, Switzerland to Levi is an approximately 8.5-hour flight. You can also drive. You'll lose 1 hour traveling from Bern to Levi due to the time zone difference. Traveling from Bern in July, expect Levi to be little chillier, temps between 22°C and 11°C. Cap off your sightseeing on the 17th (Wed) early enough to travel to Kuusamo. Kuusamo is a town and municipality in Finland. Start off your visit on the 18th (Thu): examine the collection at Hannu Hautala Nature Photography Centre, then take in breathtaking views at Julma Olkky, and then admire the sheer force of Kiutakongas Rapids. 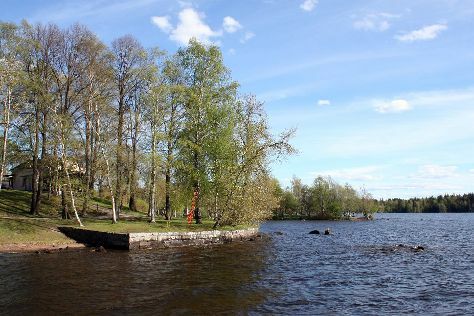 To find where to stay, other places to visit, photos, and more tourist information, use the Kuusamo online tour planner . Traveling by flight from Levi to Kuusamo takes 2 hours. Alternatively, you can drive; or take a bus. Expect a daytime high around 22°C in July, and nighttime lows around 12°C. Cap off your sightseeing on the 18th (Thu) early enough to travel to Tampere. Your day-by-day itinerary now includes Torronsuo National Park. 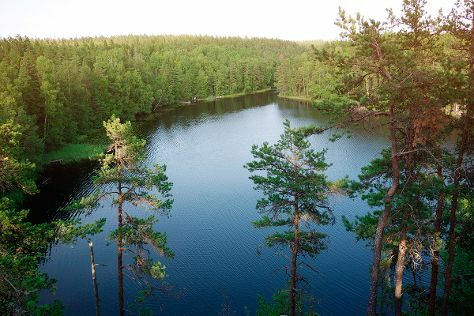 On the 19th (Fri), explore the striking landscape of Torronsuo National Park, examine the collection at The Finnish Labour Museum Werstas, and then look for all kinds of wild species at Hatanpaa Arboretum. To find where to stay, traveler tips, more things to do, and tourist information, read our Tampere online trip builder . Traveling by combination of flight and train from Kuusamo to Tampere takes 5 hours. Alternatively, you can fly; or drive. In July in Tampere, expect temperatures between 24°C during the day and 13°C at night. Wrap up your sightseeing on the 19th (Fri) early enough to drive to Kouvola. Kouvola is a town and municipality in southeastern Finland. Start off your visit on the 20th (Sat): identify plant and animal life at Arboretum Mustila, identify plant and animal life at Riverside Park, then admire the landmark architecture of Main Building of Military School, and finally pause for some serene contemplation at Saint Peter and Saint Paul Cathedral. On the 21st (Sun), you'll have a packed day of sightseeing: take a peaceful walk through Niivermaki Nature Conservation Area, then hike along Santalahti Nature Trail, then don't miss a visit to Linden Esplanade, and finally take in the spiritual surroundings of St. Nicholas Orthodox Church. For maps, traveler tips, other places to visit, and other tourist information, read our Kouvola day trip website . Traveling by car from Tampere to Kouvola takes 3 hours. Alternatively, you can do a combination of bus and train; or take a train. Expect a daytime high around 24°C in July, and nighttime lows around 14°C. Finish your sightseeing early on the 21st (Sun) so you can take a train to Helsinki. On the 22nd (Mon), look for gifts at TeeMaa Tea House, browse the exhibits of Seurasaari Island and Open-Air Museum, then get a taste of the local shopping with Hakaniemi Market, then test your team's savvy at popular escape rooms, and finally don't miss a visit to Porvoo Old Town. Keep things going the next day: tour the pleasant surroundings at Nuuksio National Park. To find maps, more things to do, where to stay, and tourist information, use the Helsinki trip itinerary builder . Take a train from Kouvola to Helsinki in 1.5 hours. Alternatively, you can drive; or take a bus. July in Helsinki sees daily highs of 25°C and lows of 15°C at night. Wrap up your sightseeing on the 23rd (Tue) early enough to travel back home.